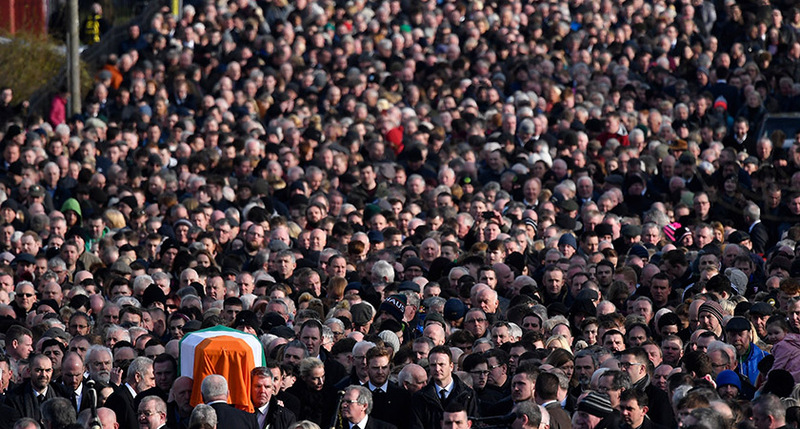 DERRY came to a standstill this afternoon as Martin McGuinness was laid to rest. Mr McGuinness died earlier this week following a short illness aged 66. While crowds lined the streets leading to the church, inside St Columba's political figures past and present gathered to pay their respects. 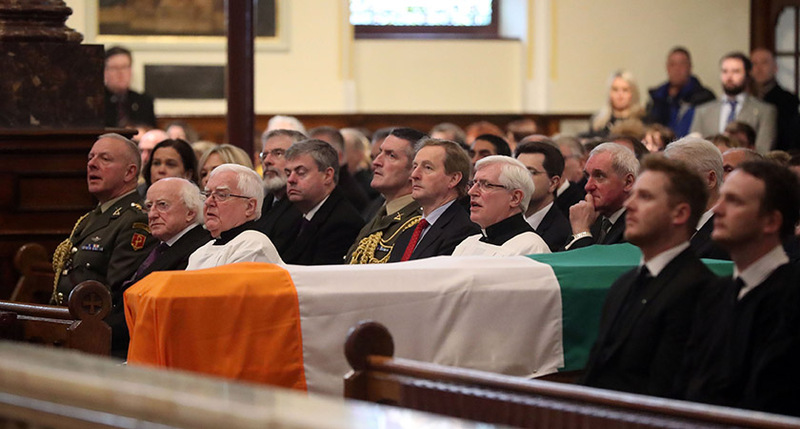 Among those in attendance was Taoiseach Enda Kenny, President Michael D Higgins, Gerry Adams, Sinn Féin party leader in Northern Ireland Michelle O'Neill, Secretary of State for Northern Ireland, James Brokenshire, former President Mary McAleese and former Taoiseach Bertie Ahern. Also in attendance, the former President of the United States and friend Bill Clinton, who flew in this morning for the service. 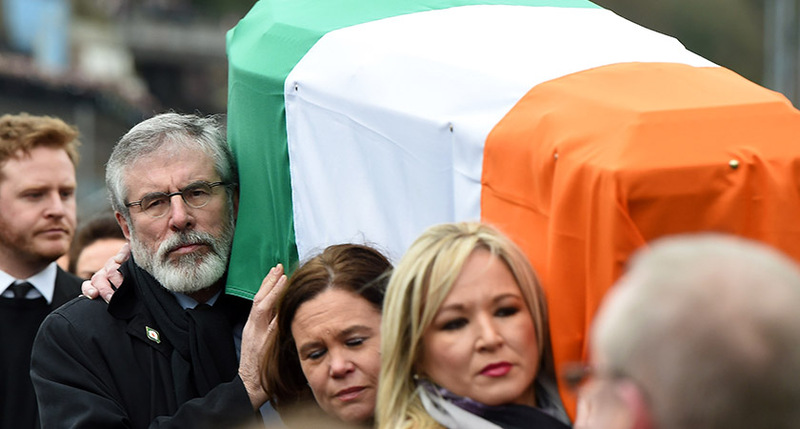 His coffin, draped in the Irish tricolour, left his home in the Bogside, Derry, earlier today at 1.30pm, arriving shortly before 2.30pm at the church. 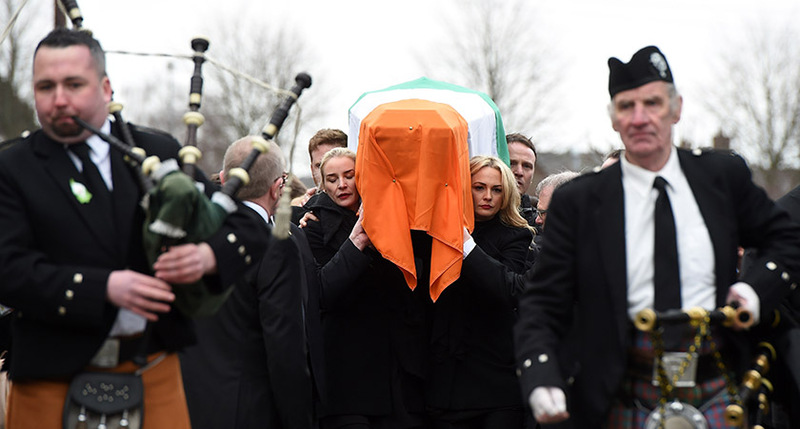 At the ceremony in Long Tower Parish in Derry, Martin McGuinness' coffin entered and exited the church accompanied by a piper. A choir sang all hymns in Irish, including Ag Críost an Síol, Bothar na Síochána, (The Road of Peace) and Mo Ghile m'Fhear. 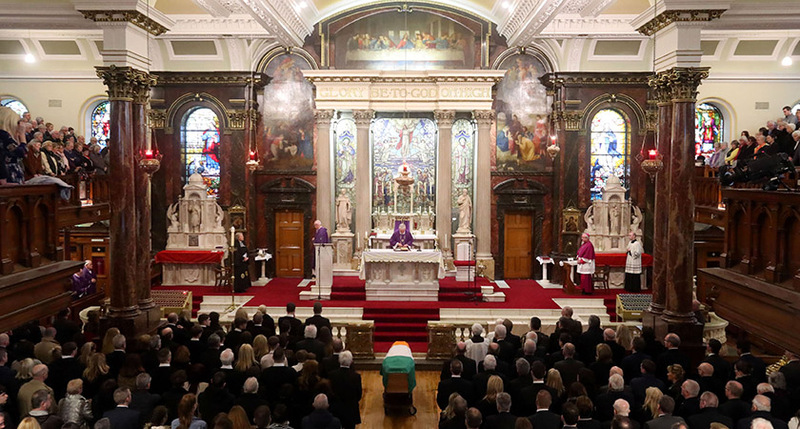 In his homily, Fr Michael Canny paid tribute to the "complex" man who liked simple tastes. "Martin was a complex man. He was born into a community where faith, Catholicism and Nationalism were intertwined. "He was a man of simple tastes who ascended to the political summit. "He visited the White House, Downing Street and Windsor Castle, but only ever felt at home in his beloved Bogside, returning to his wife and family at every opportunity. 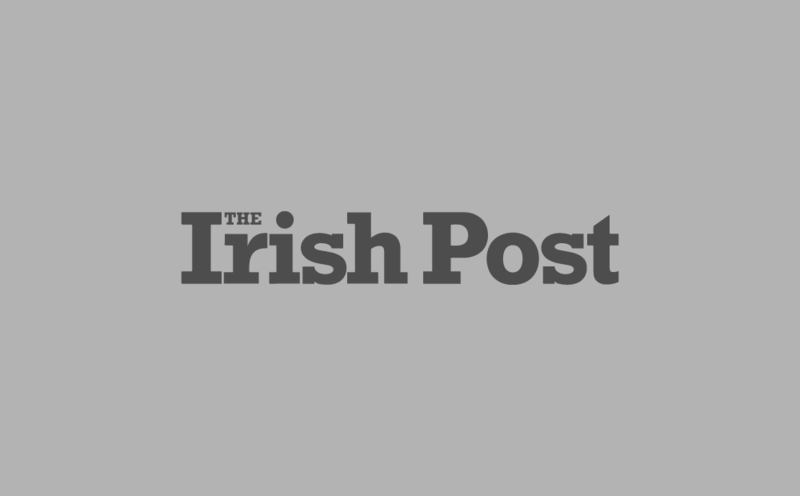 "He shook hands with presidents, prime ministers, Taoisigh and even royalty, but was most comfortable walking with Bernie along the backshore at Buncrana, or wandering at Inch Island or up at Grianan, or along a river bank fishing. "He ate many formal dinners but was happiest when eating cabbage and bacon, or a piece of salmon caught by his friend James Quinn. "Martin the Sinn Féin leader who first shared power, then became friends, with the late Dr Ian Paisley; Martin was the IRA commander who became a mainstay of the peace process. Fr Cranny also said that Martin, wasn't worried about what the historians though, instead, "he said he would leave it to the judgement of people. He asked only that he be judged fairly." The priest also said how significant political figures including Lord Trimble wrote to Martin, "telling him that he had been indispensable in bringing about devolution after the signing of the Good Friday Agreement,"
Former First Minister Arlene Foster said "I doubt that we will ever see his like again." "By any standards," Fr Cranny said, "Martin McGuinness was a remarkable man and his life was a remarkable journey. The values he had, the principles he championed are still very much alive." President Clinton also paid tribute to the legacy left by Mr McGuinness. 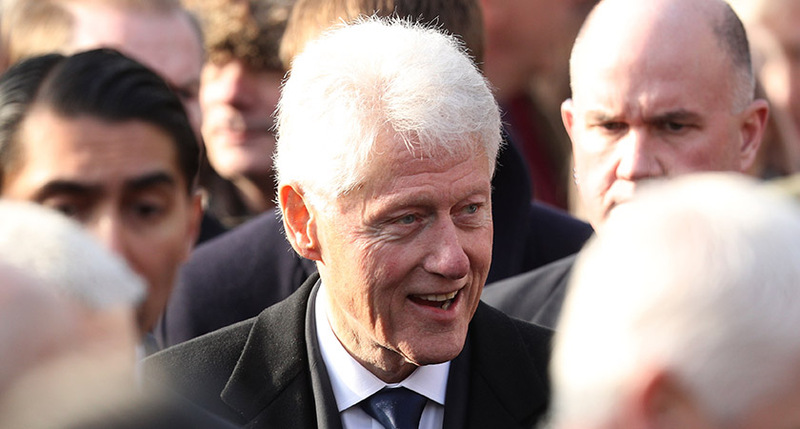 "After all the breath he extended cursing the British," President Clinton said, "he worked with two Prime Ministers and shook hands with the Queen. "I came to treasure every encounter. "I liked him, they asked me to speak for three minutes, but he could do this in 30 seconds; I could just hear him now, 'Here's my eulogy, I fought, I made peace, I made politics. "I had a fabulous family who somehow stayed and endured it all. I had friends. I was married to Gerry for almost as long as I was married to Bernie,'" Clinton joked. President Clinton also said that if those in attendance wanted to honour Martin McGuinness' legacy then "continue his legacy, make your own and finish the work of peace so we can all have a future together." "He was not afraid to make a compromise and he was strong enough that if he made it, he would keep it. "He realised you could have an Ireland that was free and independent and self governing, but still inclusive. That the dreams of little children were no more or less legitimate just because of their faith background, or their family's history or sins of their parents. "If you have came here to celebrate his life, you have to finish his work," President Clinton said. 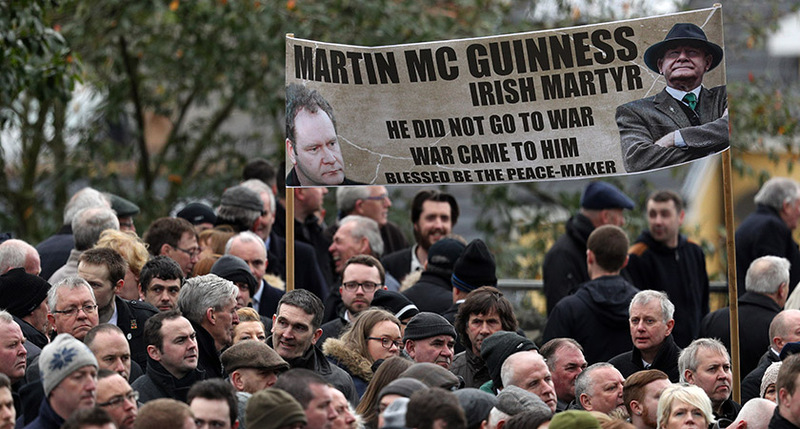 After leaving the church, the remains of Martin McGuinness were laid to rest in Derry City Cemetery. In a statement Sinn Féin President Gerry Adams said: “He will be sorely missed by all who knew him. “Throughout his life Martin showed great determination, dignity and humility and it was no different during his short illness. “He was a passionate republican who worked tirelessly for peace and reconciliation and for the re-unification of his country. 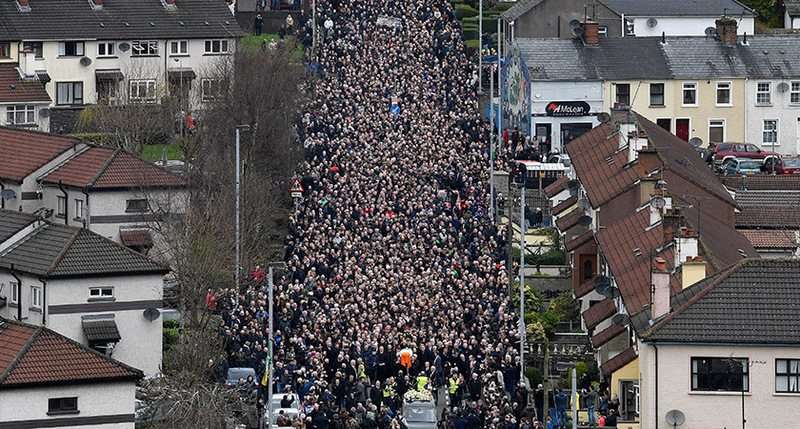 “But above all he loved his family and the people of Derry and he was immensely proud of both." 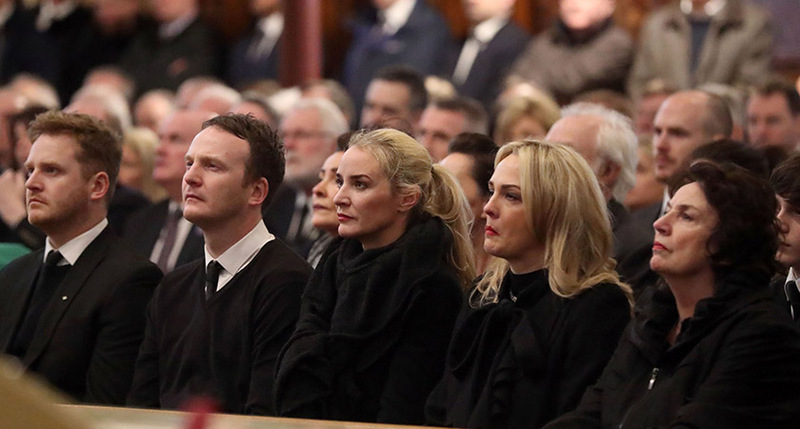 Martin McGuinness is survived by his wife, Bernadette (Bernie) McGuinness, and their children Grainne, Fionnuala, Fiachra, Emmet and his grandchildren.